In March I got an email from Shelley inquiring about photographing her daughter before her First Communion. After I met with the Shelley&Peter I knew it was going to be a great session. Shelley had arranged for Ava to get their hair done in the morning, she had a beautiful white dress to wear – with a tiara! – and the photos were to be taken at the Crowne Plaza in Niagara Falls before brunch. I had never been there before but they assured me it was a beautiful old building, they definitely didn’t oversell it – it’s gorgeous! The morning of the First Communion and Ava and her family were undoubtedly up early. Ava was such a trooper for me; she smiled beautifully – even through quite a few yawns. It was only 10am, her day was just beginning and she was already tired, poor girl! But it was worth it, she looked like a little bride – so pretty – and she will have these photos to look back on for the rest of her life. How gorgeous are this girls eyes??! Lovely! 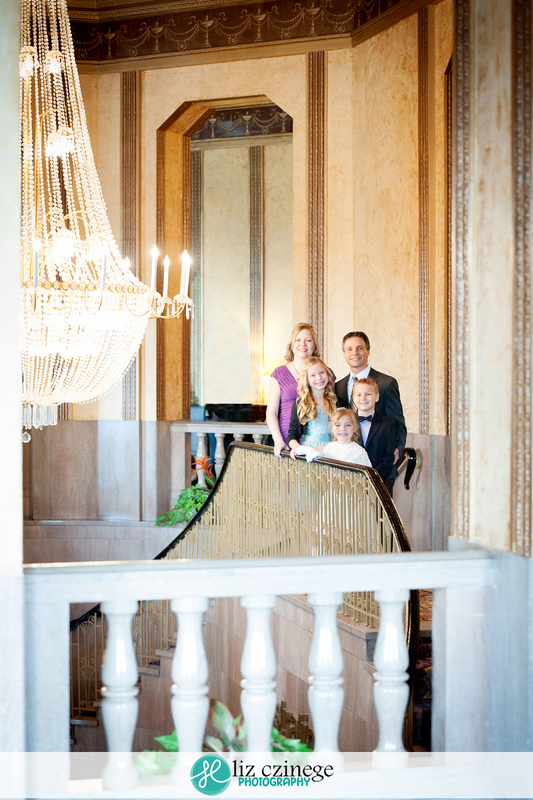 The Seca’s are a gorgeous family, I loved working with them! They definitely made it easy on me – perfect smiles all around! Of course we had to get a few glamor shots of Hannah&Noah for mom – it’s not every day that the whole family is dressed up! I love the old architecture in this building. Built in 1929, the Crowne Plaza was originally named Hotel General Brock, after Sir Isaac Brock. Shelley took this photo of Ava and I before I left and was nice enough to send it to me. I love having photos with my clients!